Business owner: "Something that took us eight days would have taken them years"
(CNN) -- Their livelihood was being threatened, and they were tired of waiting for government help, so business owners and residents on Hawaii's Kauai island pulled together and completed a $4 million repair job to a state park -- for free. 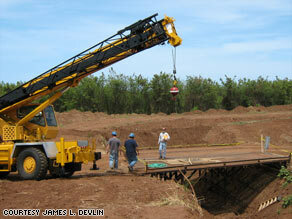 Volunteers bring in a heavy crane for work on a bridge to Polihale State Park on Kauai last month. Polihale State Park has been closed since severe flooding destroyed an access road to the park and damaged facilities in December. The state Department of Land and Natural Resources had estimated that the damage would cost $4 million to fix, money the agency doesn't have, according to a news release from department Chairwoman Laura Thielen. "It would not have been open this summer, and it probably wouldn't be open next summer," said Bruce Pleas, a local surfer who helped organize the volunteers. "They said it would probably take two years. And with the way they are cutting funds, we felt like they'd never get the money to fix it." And if the repairs weren't made, some business owners faced the possibility of having to shut down. Ivan Slack, co-owner of Napali Kayak, said his company relies solely on revenue from kayak tours and needs the state park to be open to operate. The company jumped in and donated resources because it knew that without the repairs, Napali Kayak would be in financial trouble. "If the park is not open, it would be extreme for us, to say the least," he said. "Bankruptcy would be imminent. How many years can you be expected to continue operating, owning 15-passenger vans, $2 million in insurance and a staff? For us, it was crucial, and our survival was dependent on it. That park is the key to the sheer survival of the business." And after only eight days, all of the repairs were done, Pleas said. It was a shockingly quick fix to a problem that may have taken much longer if they waited for state money to funnel in. "We can wait around for the state or federal government to make this move, or we can go out and do our part," Slack said. "Just like everyone's sitting around waiting for a stimulus check, we were waiting for this but decided we couldn't wait anymore." Thielen has been waiting, too. She wants the legislature to approve her Recreation Renaissance project, a $240 million booster shot to help fix parks across the state. Without it, at least five state parks may be forced to close, and there would be no emergency repair money to fix Polihale State Park. The park is a fixture on the west side of the island and a favorite spot for many in the area, but it's also a hub for tourists. "Tourism is our lifeblood. It's what pays all of our bills," Slack said. "The money that pours in comes from tourism is really an important factor for everyone here in Hawaii, and it's such an important time to encourage tourism." And it's an important time to keep jobs, which were threatened if the park had to remain closed. In February, Kauai's unemployment rate was at 9.1 percent, up from 2.8 percent during the same time in 2008, according to Hawaii's Department of Labor. "I think it's crucial to say the doors are open, everyone is ready," Slack said. "So when one of the most important parks in Hawaii is closed, it really changes things." Now, because of their hard work, volunteers hope they'll be ready to send that positive message -- right in time for the tourist season. Slack said he likes to have business up and running by April 15, and the season gets busy around May 1. The business owners and residents are hopeful that their generous contributions in time and resources mean the park should officially open soon. Pleas says they have only to get the new bridge certified and do minor cleanup. "A lot of people are quietly sitting by, waiting for it to open," Slack said. "This really this is one of the nicest parks in the state and in all of Hawaii, in the entire state parks department. Now, hopefully, those people get their wish."